I might be premature in writing this blog post as I know there are going to be more miracles to tell and probably more obstacles to overcome but I know things are just going to get busier and I can't wait to share about God's goodness and faithfulness! This 4th of July weekend we are in Indianapolis looking for a house. It has not been easy! We are trying to stay under budget because we want to be able to do fun things and not just pay a mortgage. That seems to be the trend now days too as some people are buying tiny houses because they no longer want to be slaves to their stuff and paying out the wazoo for a mortgage. Anyway, like I said, it has not been easy!!! We thought we were either going to have to settle for a 3 bedroom, 1200 sq. ft. house or a severe fixer upper! We also thought we would have to be 20 to 30 minutes from the church where Tom is going to work. Finally, on the third day (like the Resurrection), we found something decent that happens to also be a foreclosure (which is making it more affordable) and only 10 minutes from the church! It is probably a good thing that it is the last house we saw because if I had seen it first, I may have not been open to. It is really close to the neighbors! We arrived however before our realtor and one of the neighbors happened to be out. She was a young mom with a couple kids. She was really nice and I could see myself being friends with her and our kids being friends as well! I was really hoping I would like the house! We walked in and it didn't smell, so that was a good thing! It also had high ceilings which made it feel bigger even though it was only 1800 sq. ft. It also has 4 bedrooms and an upstairs loft! The back yard is nice and fenced in and beyond the yard a walking trail that leads to a big community playground! The kids are going to love it! The only thing it needs is new flooring because it currently has green carpet throughout the house. It will still be an adjustment I'm sure! When we get back to Florida, we will probably have to have a big garage sale to sell a lot of our stuff as we will be going from a 2600 sq. ft. house to an 1800 sq. ft. house but I am excited about it and didn't feel like I had to settle too much. On the selling end, things are going well too. On Friday, while we were away looking at houses, the inspection was taking place on our house. All 6 of our kids and our dog were in the house. They wanted to at least walk to the ice-cream shop down the road while the inspector and buyers were in the house but it ended up raining. It worked out though and my older daughters said the buyers were really nice, seemed pretty laid back and really like and want our house! It also turns out that they are Christian and even prayed with my kids before they left! It makes me think about how while fixing up and renovating it, I imagined Jesus preparing the house for somebody. He definitely was and I look forward to sharing that with them! Anyway, things are happening quickly and smoothly. We can't believe it has only been 6 weeks since Tom was offered the job! There have been some things that we thought were going to be big obstacles but they are turning out to be non-issues. 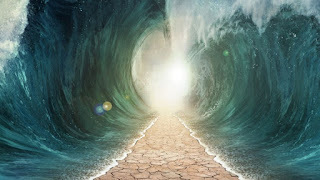 He is definitely parting the red sea and we are seeing miracles! I'll have to share more in detail about them later, when everything is complete and we are moved into our new house.